Hi friends! I suppose now that Thanksgiving is over, we start the countdown to Christmas. We have a few weeks of school between now and then but I have already started my list of things to accomplish while I have two weeks off. I didn't cross many items off my list during Thanksgiving break as many other things seemed to take over (like Gilmore Girls on Netflix:). I did some shopping for gifts already and did buy myself one beauty item on Black Friday which I will include in my November Haul which I will post in the next week or so. This is going to be my update on Project Use It Up for November. I have been doing pretty well with masking once a week. I have found that I am more likely to do it during the week (I have been aiming for Tuesdays) when I am home and doing things around the house instead of weekends when we are out and about. So, I will cross off that fourth box today since this is going up on Tuesday. I used up all five foil packets but must have forgotten to cross off the boxes. I reviewed those samples on my Instagram (@lovetobebusyblog). I was much better about using my peel pads this month but I still haven't been painting my nails. 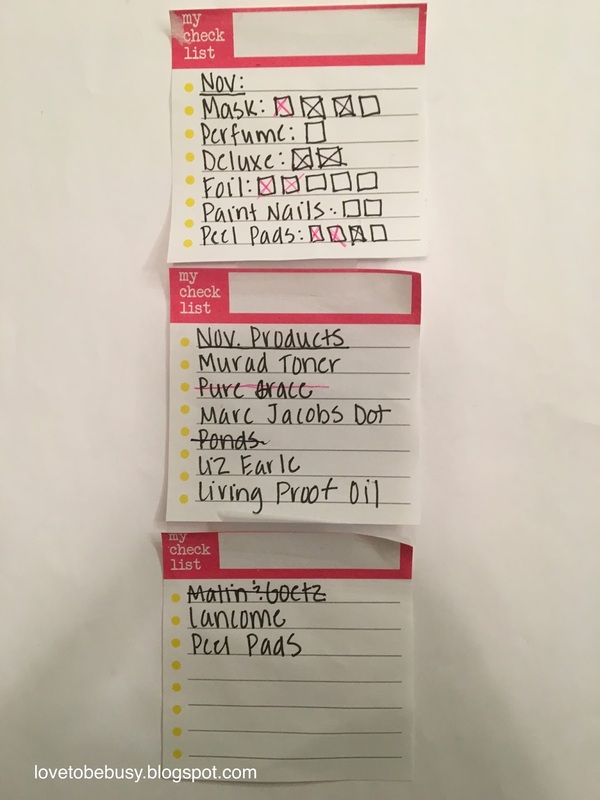 I finished the Pure Grace perfume and Malin and Goetz mask which you will see in my empties. I am considering the Ponds cream finished since I have 1-2 uses left. These are my December goals. 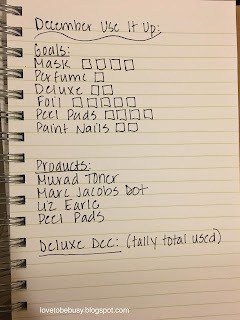 I am trying out listing them out in my notebook where I keep track of all my other beauty info. My overall goals are the same for the month. I am keeping a few products that I want to continue to work on. I took out the Ponds cream since it will be finished very soon and I will use the Liz Earle in its place. I am not adding any products in because during December I will be working on all my deluxe sized products so I want to focus on those. I will keep a tally of how many I finish as well as a list with my empties. 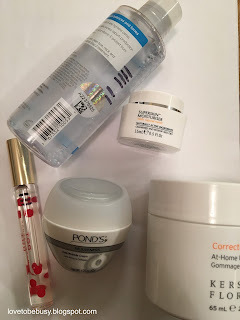 These are all the products I am carrying over from November. I have barely used the perfume since I was concentrating on finishing the Philosophy one. I will focus on this one now. I have 8 peel pads left. I have been using 2 at a time because they are so dry now that I need one for each side of my face. So, I hope to have those gone this month also. My big focus will be moving out deluxed size samples this month. I will keep you updated on Instagram as I have empties. 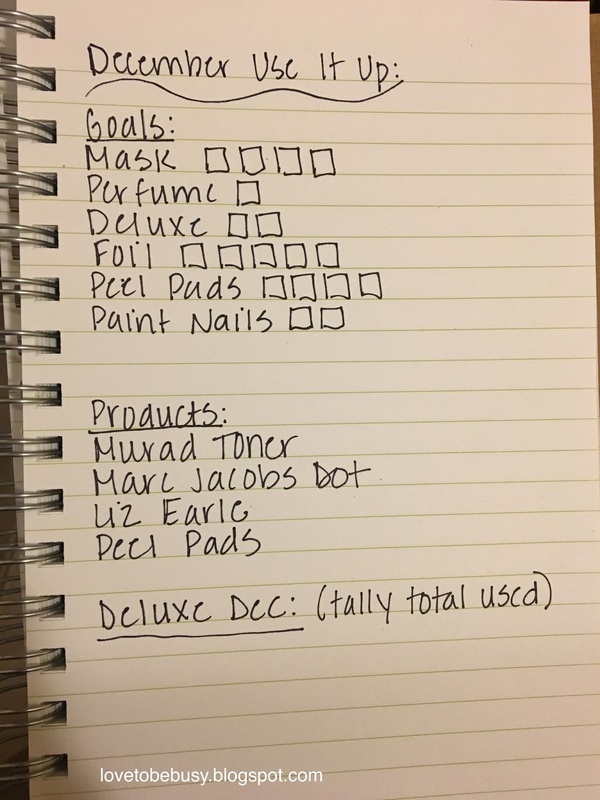 I am working on big goals and how I want to organize my beauty info for next year. 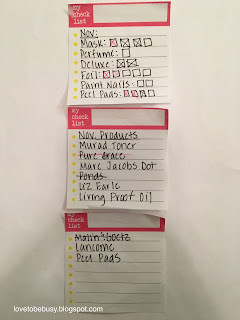 If you are interested in seeing how I plan to organize my beauty notebook, let me know. I will blog about it after I get it all set up if people are interested (keeping some things I do now and modifying a bit after seeing Curious Sparkles post about hers on Youtube). *All products were purchased by me. All opinions are my own. I was not compensated in any way for this post.